Culled from live performances from 1963-1965. 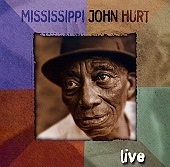 Though primarily from an April, 1965 concert staged at Ohio's Oberlin College, and several tracks from his Newport appearances during those years, Live finds the blues legend Mississippi John Hurt at his best, playing the blues as organic and natural as it gets. He makes it sound so easy, all the while you know his songs are anything but, as his fingers and guitar make love to each other, and his mellow, relaxed voice eases you into feeling right home. The folky "Candy Man" and "My Creole Belle" find Hurt lulling you into a slumber as he sings you to sleep. On "Salty Dog Blues" he sings his heart out, playing back porch blues as gritty as it comes. And on "Baby What's Wrong With You," it is Hurt's guitar that does the singing, while Hurt tells a story to accompany the passion of the music. This is premium blues, aged and alive, sounding both classic and modern, vital and fresh, letting it all hang loose as Hurt's soul and versatile instrumental abilities form a partnership that will warm your heart. I'll give this an A+.